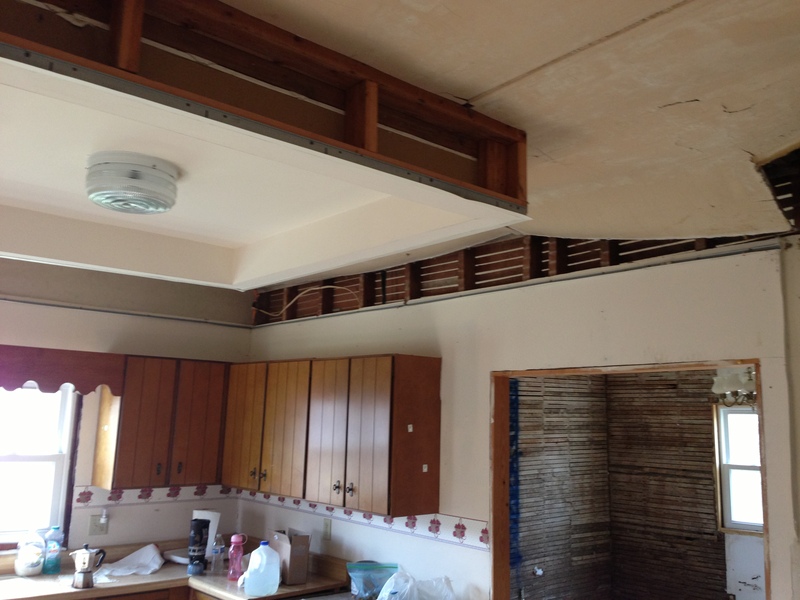 Our kitchen ceiling is pretty interesting. It had a drop ceiling (like the other rooms), but in the center, a sort-of cove ceiling treatment where the overhead fixture is centered. 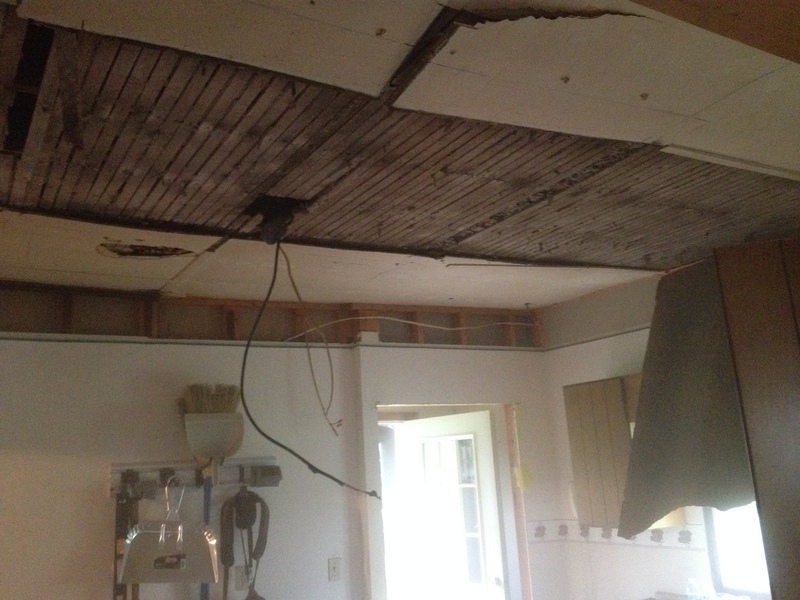 Once Ben took the drop ceiling out, this is what we were dealing with. 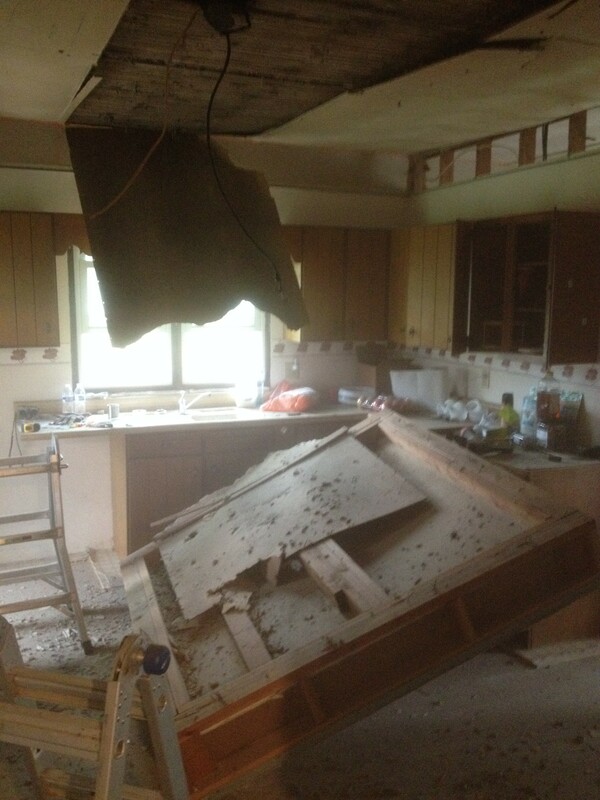 Basically a framed-out box and some really old paneling over plaster … some of it falling in. You can see that the paneling is in fabulous shape, right? Ben and I talked about ways to work around the box, how we might keep and incorporate it, or how we might take the sides off and keep the middle part. In the end, we decided the whole box just needed to go. Tyler and Ben got to work. And this happened. Please tell me why the video camera wasn’t rolling??!!?? We really just need a 24/7 GoPro so we don’t miss the good stuff. Instead, here’s a look at Ben pulling down plaster. How he does this without a mask confounds me! It is possible that Ben may be exposing himself to asbestos. You should have some samples tested. On the other hand, it may be pre-asbestos era. Anyhoo… tell Ben to take it from someone with half-dead lungs, wear a respirator! AGREED!! I know there is a respirator in the house. But I’ve never seen any evidence of anyone wearing it. Preach it, Kim! Maybe he’ll listen to you.